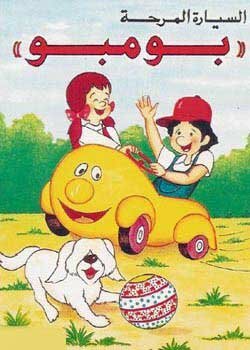 If I’m not mistaken, this cartoon has to be part of my earliest memory. I don’t recall what I liked about the car, but I do know that the idea of a talking vehicle was engraved in my head and may very well be the reason why I obsessed over Thomas the Tank Engine when I got a little older. This entry was posted in Cartoons & Anime, Cartoons of the 80’s by 3baid. Bookmark the permalink. Oh I looooooooved Captain Majid. 2. Al Haddaf may9ek 3al a9el -> “Captain Majed”.. but I enjoyed it as well. 3. Mazinger Z 3ala 7ad 3elmi was made before Grendizer o kan esooga Koji Kabuto gabel layroo7 7ag Dr. Amoon, eb awal laq6a in Grendizer’s 1st episode u’ll see him arriving in his yellow TFO and having a flashback of Mazinger Z.. it was a nice cartoon indeed.. I remember the days I used to open 6 or 7 Captin Majed wafer bars to get a new sticker and hide the baskoot wara il kabat so my mom maa itchikni. AND I actually thought my N shorts were the same too! I was also obsessed about Lady Lady. Definitely. Even more than Sally. “A7laam Al Thahabiya” – Is that what it was called? It’s about Esteban and his three friends. LOVED this cartoon so much. Another great list you got here 3baid; although none of them are my favorite (I like them but not obsessed with them). The ones that I was obsessed with are the ones that are based from books such as “The One with the Tall Shadow (9a7eb el ‘9el el 6aweel)”. Ohh by the way, was that the song of credit roll of Inuyasha? I like Inuyasha but not as much as Full Metal Alchemist LOL. Captain Majed!!! My cousins and I used to trade the stickers that came in the wafer biscuit thingies…remember them??? I had one helluva a collection! PLEASE do tell me eb ay ma7al bethab6 agdar a7a9lah? 3ayazt adawer online :( 6ala3 el correct spelling is “Jyuohmaru” bas no luck at all mako ella some electronic games and such not the action figure, not even on eBay… wedi shy made by the famous Bandai, they make high quality toys like my Grendizer set..
Laialy, DVD? LOL! Cool! Where did you get it from? Captain Majid has got to be my favourite even though I never understood what was going on. PS: u can find Jyuohmaru action figurs in hobby Japan in Rihab Center. actually there’s even a better source, Q8 Cartoons they are located in Al-Wala’ Complex.. 1.500 KD/DVD and they have a great collection! There was another cartoon, with a giant tomato super hero.. He had a saying something like ‘tam tam tamaatam’ to activate his tiny tomato minions. I haven’t been able to locate that cartoon anywhere Could someone help me find it please. By far the best cartoons ever made…. there was one cartoon, a kid who plays baseball like his father…this kid can spin the ball in 20 different directions….the ball dips, slows down and acclelerates all in one…. I NEED PLEASE TO BUY KHOMACY AND JUMARO. One more I can’t remember. One of the characters drove a car and the others had other transportation of some sort. I remember the car driver – black hair, teenager, red t-shirt cut high and white pants, or tights (looked like ballet gear). I used to watch this cartoon in the 80’s but can’t remember what it was. anyone? but i reallyyyy need some help in locating this other cartoon of an old woman with a bun on her head and she carries a spoon on her back and becomes small and the spoon becomes big or something like this…. does anybody know where i can watch or get hold of a few of those cartoon clips? I think you’re asking about a cartoon called Lady Spoon.